A couple weeks ago, as a couple of colleagues and I prepared to head down to Austin to support an event at our company's site there, I caught an episode of Bizarre Foods America during which Andrew hit up a really beautiful BBQ place downtown called Lambert's Downtown Barbecue. You don't see a lot of upscale BBQ or reinventing the wheel on Texas BBQ at all, so I booked us for dinner there this week. Andrew does not steer his viewers wrong. 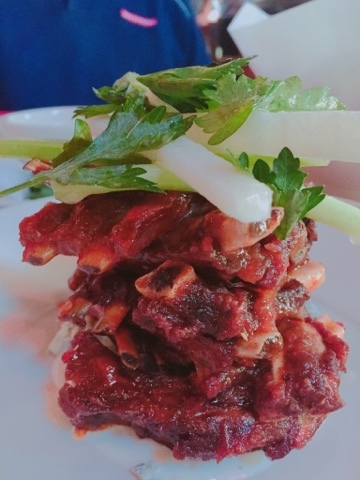 We were still enjoying drinks in the bar when an adorable mom and daughter ordered the wild boar ribs and told me how delectable they were. Our first dish was cemented. These tiny ribs were taken so far in the smoker, the fat had rendered down completely and left the meat almost crispy - but not dried out - kind of like extra crispy chicken wings. To reinforce the wing vibe, they were glazed with honey and sambal, which tasted like a remarkably upscale buffalo sauce. And to further gild the lily, celery and buttermilk blue cheese added freshness and earthy funk to the deep, sweet, smoky ribs. This is a singular dish, and worth enduring the disgusting heat of Texas for. When in Austin, one must order queso. It's the right thing to do. 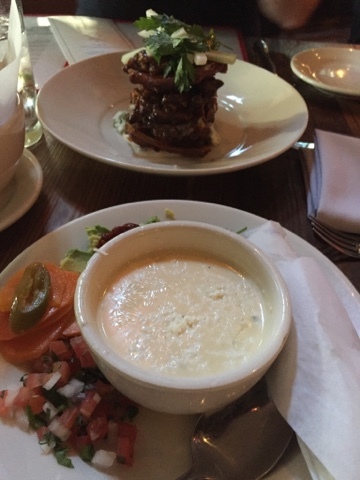 At Lambert's, the green chile queso comes accompanied by tortilla chips, soft tortillas, avocado, cilantro and pico de gallo. This is no Velveeta and Ro-tel heated up in the microwave, folks. The cheese itself was mild and thick - absolutely aces with the cool, creamy avocado chunks. Be still, my barely still beating heart! We absolutely didn't need another starter,mount my colleague Ernie had never tried duck prosciutto, and Lambert's has it on its charcuterie platter. I couldn't let Ernie go one more day without trying this delicacy! Never mind that it also had foie gras pate and spicy cornichon. The decadence was bordering on absurd at this point, and we hadn't even gotten to the entrees yet. 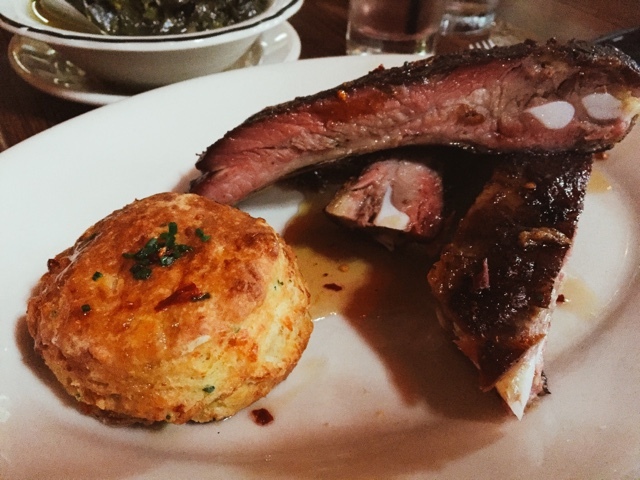 The main dishes at Lambert's are divided into two categories: oak smoked and grilled. We were after BBQ, so while I ordered the pork ribs, the fellows chose the brisket. The huge ribs were smoked over oak and glazed with maple syrup, for a sweet finish completely unlike the usual cloying sweetness most BBQ sauces lend. They were cooked perfectly - tender enough to flake the meat off with a fork, but not so much so that it completely fell off the bone. The blush of the smoke ring illustrated the earthy taste of the oak,me hole a rib of fennel and coriander added a subtle hint of floral grassiness to underscore the maple. Thankfully, none of those flavors outshone the pork itself, which was robust. A chive and cheddar biscuit on the side was a hair over baked, but still pretty tasty with the pork. The guys' brisket was rubbed with coffee before its trip to the smoker, which had a remarkable alchemy with the beef fat and smoke - a deep, dark flavoring teetering on the edge of bitter without careening over the side, thanks to some brown sugar in there to save it. 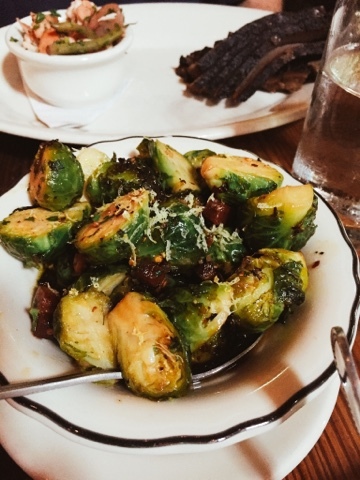 Our family style sides were macaroni and cheese (not my favorite - a little bland for me), collards cooked with smoky bacon and just shy of completely broken down (absolutely scrumptious) and Brussels sprouts rooted with brown butter and more house made bacon. 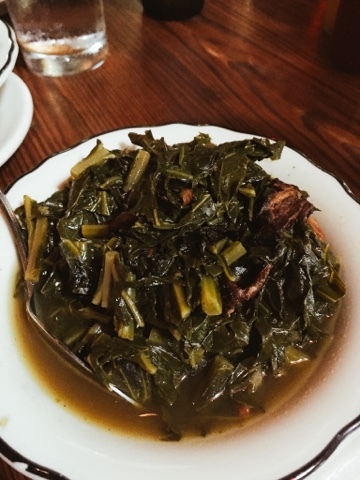 I was all about those collards, man. I love roasted sprouts, but the brown butter with these made them more bitter than I prefer. We were very excited that fried plum pies were on the dessert menu, but our stomachs, groaningly full at this point, were not having it. And you just can't take a fried pie back to the hotel room, so these will have to wait for my next visit. No matter - our food and service at Lambert's were phenomenal - a nine on the BHS scale. 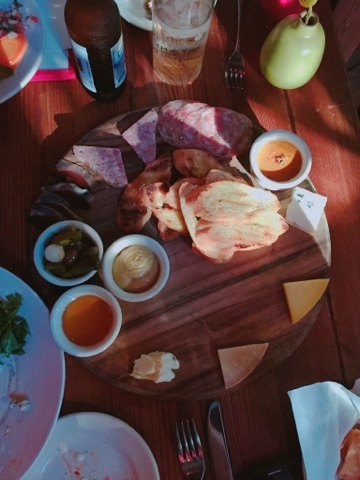 This hip, "fancy BBQ," joint has some of the most modern riffs on classic Texas barbecue you'll find anywhere, with a refined edge that's so much more downtown Austin that Hill Country. You've got to get there and get Lambert's oak smoke in your mouth! My personality is big; my hunger is bigger!